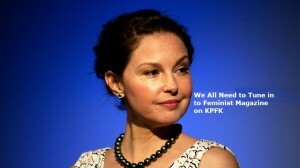 Ashley Judd Writes a Kickass Feminist Essay… ?AND made a PSA for Feminist Magazine on KPFK! Ashley Judd’s ‘puffy’ appearance recently sparked a viral media frenzy. But, the actress writes, the conversation is really a misogynistic assault on all women. Read her Essay below… and LISTEN right here to the fabulous PSA Ashley made for Feminist Magazine about why women’s & girls voices matter & why it’s important to support woman-made media and to Tune in to Feminist Magazine !